Obama says 'no daylight' with Israel, while stressing this is 'the best option' and 'a good deal,' outlining its details. US President Barack Obama made a public address at the White House on Thursday after Iranian and world negotiators announced that a framework deal had been reached over the Islamic regime's nuclear program. According to the president his negotiating team, led by US Secretary of State John Kerry, "has reached an historic understanding with Iran which, if fully implemented, will prevent it from a nuclear weapon." "I am convinced that if this framework leads to a final comprehensive deal it will make our country, our allies and our world safer," he asserted. Obama's address can be viewed in the video below, by jumping 21 minutes into the video. Recalling the path to the negotiating table which led to an interim deal in November 2013, he remarked how the Islamic Republic of Iran has been advancing its nuclear program for decades, until the "hardest sanctions program in history" brought it to negotiates. "Today after many months...we have achieved the framework for...(a) deal, and it is a good deal, a deal that meets our core objectives," he said, claiming it cuts off every pathway to developing a nuclear weapon. Obama further claimed the deal includes the "most transparent" program of inspections "ever negotiated for any regime in history." He said the inspections agreed to make the deal based on verifiable evidence, stating the deal is "not based on trust." The deal blocks three key "pathways" to the nuclear bomb Obama said. First, he claimed the deal will not allow Iran to develop weapons grade plutonium, and will see the core at the Arak facility dismantled, with spent nuclear fuel shipped out of Iran for the life of the reactor. Likewise he said Iran agreed not to build a new heavy water reactor, or process fuel from its reactors "ever." Aside from plutonium, the deal shuts down the path of achieving a nuclear weapon with enriched uranium according to the president, who said Iran agreed to a two-thirds reduction of its installed centrifuges. It will not enrich at the Fordow plant, and limit uranium enrichment for the next ten years as part of the deal, he said. The majority of enriched uranium will be neutralized as well, and Iran is not to stockpile the materials needed in building a nuclear weapon for the next 15 years. Speaking about the issue of stockpiles, Obama claimed that even if Iran violates the deal's limitations on enrichment within the next decade, it will be a full year away from having enough materials for a bomb. Israeli estimates place that breakout timeline as being considerably shorter. A third pathway guards against covert construction of a nuclear bomb, with Obama touting "unprecedented access" for international inspectors to Iranian plants and the flow of materials used in the program. "If Iran cheats the world will know it," he promised. "If we see something suspicious we will inspect it. Past efforts to weaponize the program will be discussed." Obama said Iran would be subjected to "more inspections than any other country." Outlining the timelines of limitations, he said there would be a ten year limitation on uranium enrichment, a 15 year limit on building new facilities, and guidelines for transparency to be in effect for 20 years or more, with "some permanent" restrictions as well. He also said Iran would sign on to becoming a Nuclear Non-Proliferation Treaty member. In return for the deal, Iran can expect relief from sanctions. 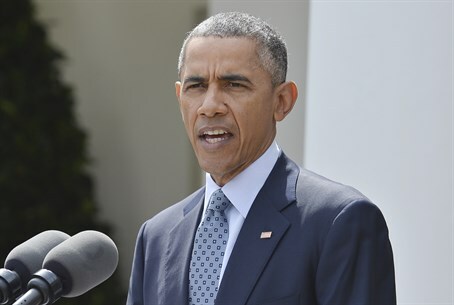 Obama said the relief will be "phased as Iran adheres to deal, if they violate the sanctions can be snapped back." He said other US sanctions over the Islamic regime's support for terrorism world-wide, its human rights abuses, and ballistic missile program will stay in place. The deal is not yet signed, he noted, saying between now and the end of June negotiations will continue to work out the details of how to implement the plan. Obama promised to have negotiators "fully brief Congress and the American people" on the substance of the deal, saying he is "confident we can show it is good for the US and its allies." According to Obama there are three possible ways to address Iran's nuclear program, the first being a "robust and verifiable deal like this one," the second being to bomb Iran's nuclear facilities, and the third to increase sanctions. Military action would "start another war in the Middle East" and set back Tehran's nuclear program by only "a few years," he said - while at the same time giving the regime added impetus to push on to develop nuclear weapons. The US president claimed the amount of time a military strike would halt Iran's march to nuclear weapons by only a "fraction of the time" achieved by the framework deal accepted earlier Thursday. Obama dismissed the option - advocated by Israel, among others - of ramping up sanctions to increase pressure on Iran to capitulate. "Every time we have done so Iran has not capitulated but instead advanced its program," he insisted. "Iran isn't going to simply dismantle its program because we demand it to do so," he claimed in brushing aside the military or sanctions options. Addressing the Iranian people, he called for engagement on the basis of mutual interest and mutual respect. "Iran's Supreme Leader issued a fatwa (Islamic ruling - ed.) against the development of nuclear weapons," said Obama, calling this an "opportunity" to verify that the program is peaceful. Obama claimed that the "majority of the world" considers the agreement to be a "fair deal," adding that with alleged world favor for a deal it is "doubtful" whether the US would be able to keep even the existing sanctions in place. Facing critics of the deal, he asked whether they thought the deal is worse than the risk of another war in the Middle East. The deal "will not end deep divisions and distrusts between our two countries," he said, noting concerns remains as long as Iran continues its support for terrorism, and "threats against America's friends and allies like Israel." It is "no secret" that he and Prime Minister Binyamin Netanyahu disagree about the way to confront Iran's nuclear program, he said. If Netanyahu is looking for the most effective way to ensure Iran doesn't get a nuclear weapon "this is the best option," claimed Obama. Obama said he will speak with Neatnyahu today, promising there is "no daylight" in the US's support for Israel's security, and vowing to discuss how to further security cooperation with the Jewish state. He said he had also spoken to the king of Saudi Arabia recently - another leading critic of the deal - and is inviting the leaders of the Gulf Cooperation Council which consists of the Saudis, the United Arab Emirates (UAE), Kuwait, Oman, Qatar and Bahrain for a meeting in Camp David this spring to discuss security cooperation and the conflicts and chaos in the Middle East. In what is likely a response to heavy opposition to the deal coming from Congress, Obama said in the coming days and weeks he will engage Congress about how it can play an oversight role, saying these are matters of war and peace and not "politics." This is "not simply a deal between my administration and Iran," he said. "This is a deal between Iran, the United States of America and the major powers in the world." But he warned that if Congress kills the deal without addressing "expert analysis" and without presenting an alternative, then the US will shoulder the blame for a failure of diplomacy. The White House's push for a deal with Iran has faced serious opposition within Congress. A recent letter sent by Republican Senators to Iran warned that the deal will not outlive Obama's presidency, which is set to expire in 2016. Obama concluded by drawing a comparison with some of his predecessors, including former President John F. Kennedy, who faced a "far greater threat" of Communism, and yet was willing to strike diplomatic deals with Moscow, downplaying the threat of radical Islam armed with a nuclear weapon. Quoting Kennedy, he said "let us never negotiate out of fear, but let us never fear to negotiate," appraising that in the end the US policies during the Cold War "made the world safer."